Florida is known for its beautiful beaches, great weather, pristine communities, and senior traffic heading to the “Early Bird Specials”. For many, it’s considered to be paradise! The state has continued to grow every year since 1950, and its continued growth seems assured. During the winter months in the northern and central portions of the state, old man winter still comes knocking from time to time from the north. Almost every year, some portion of Florida has a freeze warning, and the Year 2018 was no different. In 2018, the freeze went all the way to Orlando. A freeze event is very ominous for 99% of all HVAC systems, because there are no safety controls or safe guards from a coil freeze. In fact, all the chilled water systems are still active and cooling through the winter. This scenario is a perfect set up for coil freeze damage if the temperature stays below 32 degrees for even an hour or 2. All that’s necessary to create a coil freeze is a pump, valve, or damper that malfunctions, and the standing water in a coil will freeze within minutes. In 2018, USA Coil replaced the coils at a famous entertainment complex in Orlando a few times, and we replaced the damaged coils with a guaranteed solution. USA Coil & Air builds a patented series of coils called Sentry Guard™. They are guaranteed to not have freeze damage in the event standing water is in a coil and below freezing air passes across the fin surface. We can make this guarantee because Sentry Guard™ has removable plugs that relieve the pressure build up inside the tubes and headers. Once the pressure is relieved, the coil is out of danger for freeze damage. USA has been selling this line for over 2+ decades, so we know it works. In fact, we guarantee it works! When a coil contains standing water with freezing air on the finned tube portion, you are set up for a catastrophe. As the water temperature falls, it begins to turn from liquid to ice, and the entire inside of the coil raises its pressure. If that pressure increases to over 1,000 PSI, the tubes or return bends will start to bloat as it attempts to hold in the increased pressure. As the pressure continues to increase, the weakest section of the coil will develop a crack, usually in the middle of the bloated area. Please go to https://www.youtube.com/watch?v=41XPfBNtzvo to view a video that explains this phenomenon in more detail. As well as Florida, there are many states that have active chilled water systems during the winter months, including Georgia, South Carolina, Alabama, Mississippi, Louisiana, Texas, New Mexico, Arizona, and California. 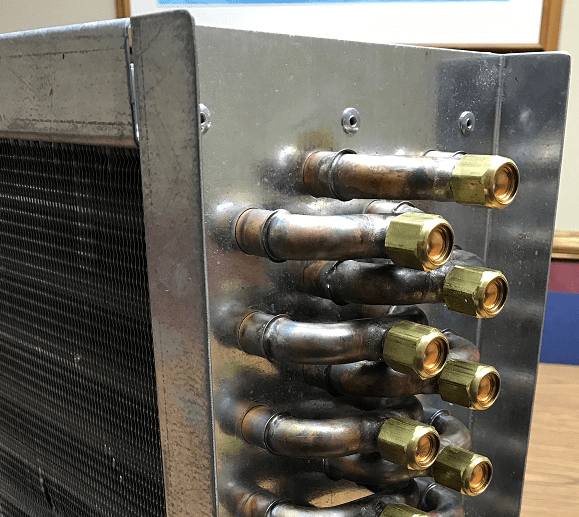 Over the years, USA Coil & Air has replaced many chilled water coils in these states due to equipment malfunctions that led to a freeze event and catastrophic damage to coils. Sentry Guard™ is the built-in insurance you need to avoid huge costs and aggravation due to a freeze damaged coil. Remember: Sentry Guard™ can be used for hot water coils, steam heating coils, and chilled water coils. It’s also important to realize that the use of Sentry Guard™ in some systems may reduce the use of higher percentages of glycol. If you are in any of the states previously mentioned; and you are running chilled water in winter, you might be adding glycol just in case of a freeze event. With Sentry Guard™, you may be able to either reduce the percentage of glycol or totally remove it. That’s your choice. There are still so many systems throughout the United States that have full or partial fresh air HVAC systems that have real possibilities for a freeze event. 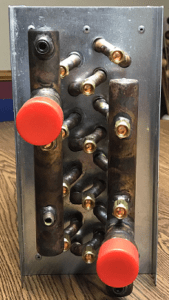 USA Coil & Air has seen many freeze stats and damper controllers that are in disrepair. There are systems that have the damper so close to the outside wall that freezing air can enter the coil through a bent louver and damper blade. On the fluid side, damage can occur in minutes due to power outages that cause the pumps or automatic valves to cease operating or even from just a general malfunctioning control.